There's less than a month to wait before you can walk into a Microsoft retail store and exchange cold, hard cash for an Xbox One X, but if you can't wait that long, you can now try out the next-generation console at certain Microsoft outlets around the world. As part of the launch at the start of November, Microsoft is going to be letting punters have a go on Forza Motorsport 7 in stores, as well as putting on competitions (with prizes) and offering "special appearances" from an unspecified group of gaming celebrities. "More participating locations will be added in the coming weeks, and soon you’ll be able to play Xbox One X at all Microsoft Store locations prior to launch!" explains Microsoft in a blog post, which is written as enthusiastically as you'd expect. Some Microsoft stores will be doing more than others to celebrate the launch of the next-gen console: in certain locations you'll be able to pick up a console at 9pm PT on Monday, November 6 (by our calculations that's 12.00am ET on Tuesday, November 7, or 5am in London). For the completely uninitiated, the new console brings with it 4K resolutions, a big step forward in graphics processing, and upscaling for your existing Xbox One X games. The console will cost you $499 (£449, €499, CA$599 or AU$649). 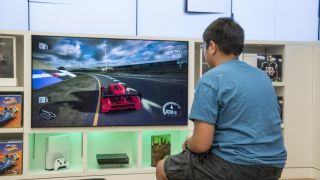 If you were on the fence about whether the upgraded Microsoft video gaming box was for you, some hands-on time at a Microsoft store might tip the balance one way or another in terms of making a purchase. You can of course save yourself the trouble and order your console online if you prefer.